The “Dinh Group” of 44 plaintiffs was named after Phuong Dinh, the most seriously injured surviving plaintiff. The cases for three of the students killed, and passengers in both Duck 6 and the bus were all joined together. Injuries ranged from severe orthopedic fractures for example requiring total hip replacements to the “walking wounded.” Everyone suffered traumatic emotional injury. Photos of plaintiffs who were passengers on the Bellair charter bus. Please click photo to enlarge. 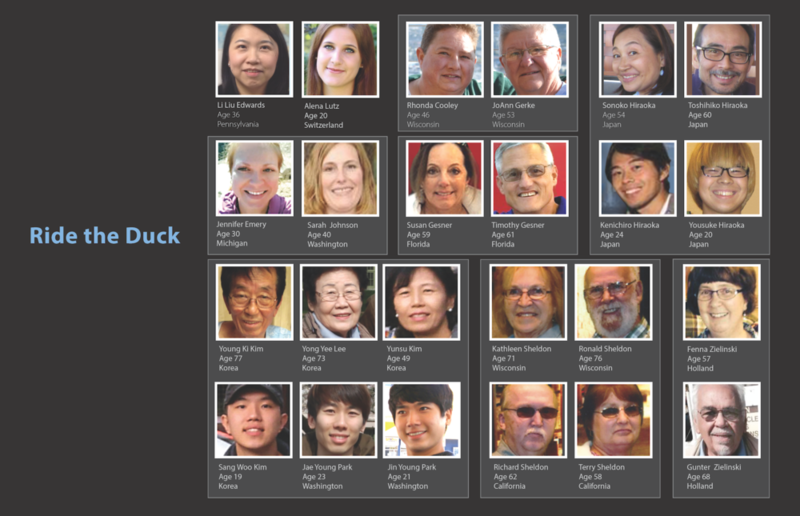 Photos of plaintiffs who were passengers on the Ride the Ducks Seattle vehicle. Please click photo to enlarge. Some of the members of the Dinh Group were represented by co-counsel. We wish to thank our co-counsel for trusting our firm to lead the litigation and try this important case. In particular, we thank Tim Loranger of Baum Hedlund for actively litigating the discovery phase of the liability case with us. Alex S. Chun (Seohee Bak and Min Kyeong Kang), Richard Benedetti (Don Clouse), Matt Dubin (Rhonda Cooley and JoAnn Gerke), Tim Loranger (Derschmidt Family), Arthur Leritz and Melissa Carter (Jennifer Emery and Sarah Johnson), Bradley Johnson and Brian Krikorian (Timothy and Susan Gesner), Doug Phillips (Mazda Hutapea and Yuta Masumoto), Anthony Marsh (Florencia Irena, Jae Won Jang, Privando Putradanto, and Na Ra Yoon), Dan Williams (HaRam Kim), Johnwon Yi (Young Ki Kim, Yunsu Kim, Sang Woo Kim, Young Yee Lee, Jae Young Park, and Jin Young Park), Jeff Hightower (Alena Lutz), David Rovang (Tam Nguyen), Wangjin Kim (Minje Sa), Patrick Kang (Kathy Sheldon, Ron Sheldon, Rick Sheldon, and Terry Sheldon), Chris Jackman (Yu Zhuang), and Bojan Dekker (Fenna Zielinski and Gunter Zielinski).